On this page you can view my portfolio, selected work from my Masters, as well as work from my Bachelors period at Industrial design can be scrolled through. Based on these projects you can see a clear interest for light and interaction design at the start of my education and the last four projects I worked on including my Final Master Project align with my current vision. By clicking on one of the tiles above you can find more information about this specific project. Information about my Final Master Project can be found under this semesters "Development". In this project I focused on lower back pain prevention for nurses. The main goal was to create a minimally intrusive design, which is comfortable to wear throughout the day. The designed shirt is able to give feedback on the posture via activity tracking. 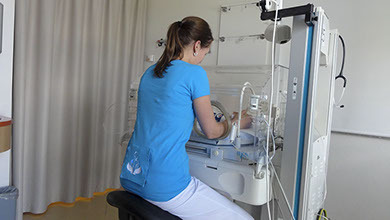 The final design was a shirt which can be worn for several hours by nurses which connects via bluetooth 4.0 to the mobile phone of the user. The complete system was integrated in the shirt with an embroidered electronic circuit to connect the sensors, battery and the bluetooth module. The system was validated in a trial (n=15) in which we found that the participants were motivated to use the shirt. This trial was based on short usage of two hours, further research is necessary to completely validate the design. During the development of the smart shirt reproducibility was important. How to mass produce these kind of wearables in the future was one of the questions that got attention. This resulted in the project being picked up by the industry to further develop this product. BackUp being used by a nurse in context. Dutch video in which the concept of the Plasma slipper which was developed in the project Enlightened2Move is explained. This video was recorded by Studio040 because this project received an honorable mention at the Social design talent award. Using a new active cold plasma technology we designed a therapeutic slipper which treats diabetic feet. 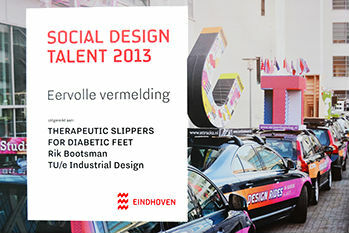 20 000 people in the Netherlands with diabetes type II, suffer from diabetic feet, which can cause wounds on their feet and may lead to amputation. This therapeutic slipper allows patients to treat their feet at home, in only a few minutes per day. With this active treatment, both wounds and amputation can be prevented. Other treatments must be performed at a clinic and may take up to 6 hours a day. These alternative treatments may include casting the patient’s feet in a plaster cast or submerging the patient in a hyperbaric oxygen tank for several hours a day. The therapeutic slipper enables diabetic patients to keep their feet healthy without losing much time or mobility by allowing them to administer treatment themselves in the comfort of their own home. The slipper is made to resemble a conventional shoe, to ease the interaction between this cutting edge technology and the patient. The treatment starts automatically when the patient tightens their slipper around their foot. The new cold plasma technology within the shoe will disinfect and cure small wounds on the feet. After the treatment is completed a visual cue informs the user they have to remove the slipper. The technology used in this slipper is based on new research within the Eindhoven University of Technology about cold plasma technology. Jury review in dutch: In het ontwerp is een grote sprong in denken waar te nemen. Er wordt een klik gemaakt tussen verschillende domeinen. Het idee heeft weliswaar raakvlakken met WMO (kwaliteit van leven, zelfredzaamheid) maar mogelijke doorontwikkeling van dit product is niet aan gemeente. Zeer wel een eervolle vermelding waard. 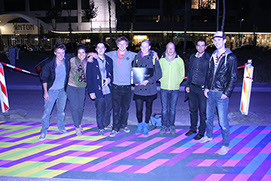 Final video of the 1 squared kilometer large light installation Iris at GLOW-Next 2013 in Eindhoven. Colors do not exist. They exist only in our minds and are the result of complex processes of observation, comparison and adjustment. 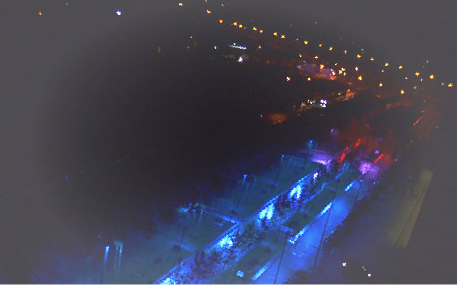 On a carpet of 240 meters long we demonstrate that you cannot believe your eyes. By changing the color of the lighting, immense patterns come to life. See how totally different colors can suddenly appear as one. Experience how red is not so red at all and suddenly can look as if it is yellow. Discover why it is that butterflies and bees can see things we cannot see. IRIS was developed in a four week masterclass of OPENLIGHT, the creative lab of the Intelligent Lighting Institute of the TU Eindhoven, with six students of Industrial Design at TU/e. GLOW! gave me the opportunity to work in a large team and explore experience design as well as designing and actually delivering a working installation. This in combination with a client, which also needs to be satisfied with the result. Was altogether a complete design process in four weeks. This was also the reason I signed up for this module and showed me that I can work really good under pressure, make quick decisions without losing the reasoning to make the decision and work in a group and keep everybody on the same page. Experience design was a very interesting area to look into, I became aware of the large spectrum of details which needs to be considered to create the perfect experience. This understanding I can use in designing more involving product experiences. It’s not just a product which people use, but the experience of using the product and everything around it. No matter how little influence I have on these details it will influence my design. Being aware of this will improve my designs. Realizing a complete installation was for me the most impressing part of this activity. The 53000 visitors who were very enthusiastic is an amazing feeling and definitely worth all our hard work. Another video of the IRIS light installation at glow, which focuses more on the interaction people have with the installation. Large material sample Vinyl, which was later chosen as final material. 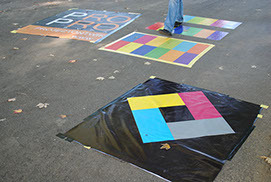 Also the design was tested on large scale at this point. And field test of the different material samples which were tested for durability at the university campus. During the module 'Designing with complex sensors' four students; Rik Bootsman, Svetlana Mironcika, Ineke Neutelings and Mart Wetzels worked on an intelligent system to interact in a tangible way with the Philips Hue lamps. They created a physical prototype to show the envisioned scenario and described the system from both the user and system perspective. The Philips Hue lamps have great potential in changing the mood in a room or restaurant, however the interaction is app based and does not always gives the user a good insight in how light can change the room. By designing a tangible object which gives feedforward about the different colors and saturation and luminance settings the Philips Hue lamps can show, the user is invited to play with the object. Three actions are envisioned to change all variables of the Philips Hue lamps. 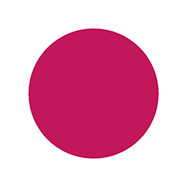 When the user rotates the knob a color wheel on the bottom will appear which will show the user which colors can be chosen with the rotating knob. 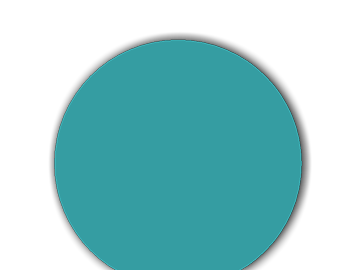 As a feedforward mechanism the color ring on the bottom of the device will show a color wheel which will rotate as well to indicate a rotating movement on the knob is necessary to change color. When the knob is rotated the current color is shown on the knob itself. To change the luminance and saturation of the chosen color, the user can move the object itself around. When he does this the color ring on the bottom will show four areas to which the user can move the device. The areas are full brightness, low brightness on the Y-axis of the device and full saturation and low saturation on the X-axis of the device. In between the areas some LED's are turned off to convey the axes used by the system. The user can choose any combination of saturation and luminance as long as they are possible to create with the Philips Hue lamps. In the rotating knob there is a button which is used to select a specific lamp. By pressing once the first lamp will start blinking as well as the led inside the rotating knob to show the system and this specific lamp are now connected. By rotating the knob and moving the device the color saturation and luminance of the specific lamp can be changed as described before. When pressing the knob again the next lamp will be selected. When all lamps have been selected once the next time you press the button will bring you back to all lamps attending to the system. Huemotion interaction/system diagram. In this diagram we describe both the system side comparable to a block diagram and the user side which is comparable to a user scenario. By combining these two diagrams in one we could optimize the interaction. Use the arrows to go to the next step or use the mouse to zoom in and out and move freely. 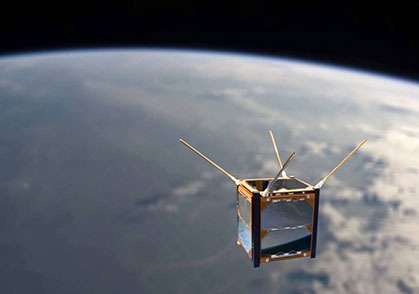 ArduSat is a miniature cubic satellite, measuring 10 cm along each edge and weighing about 1 kg. This video explains the possibilities of the Ardusat for high school students. Subtitles are available in this video and should be there automatically. 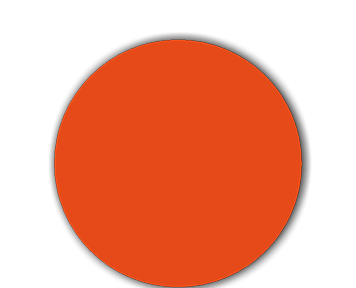 For MADLAB emergent art center, I develop and lead workshops in creative thinking, software development and hardware education. Together with ‘Kennisnet’ I worked on project Ardusat, throughout the summer and fall semester. Ardusat is a small cube, ten cubic centimeters in size, with a variety of sensors, which give the potential to measure all kind of natural phenomenons. My responsibilities for project Ardusat include educating the faculty and high school students in both how to work with the sensors and how to write code, which allows them to conduct their own experiments. In the Master class I also guided the students in creating good research questions by facilitating creative brainstorm sessions in class in such a way that both teachers and students could participate. 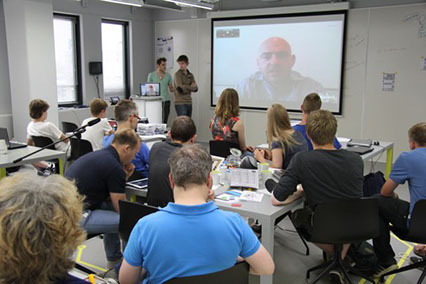 Picture taken during the presentation I gave to teachers (bottom left) and students (on the right). The total group size was around 25 people. The Master class incorporated presentations, workshops and self explorations with the materials. A total of 4 master classes have been carried out over a period of 6 months. 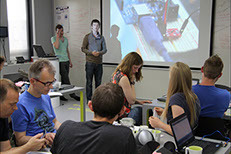 The Ardusat satellite we programmed during the Master classes. The satellite was dropped from the international space station. 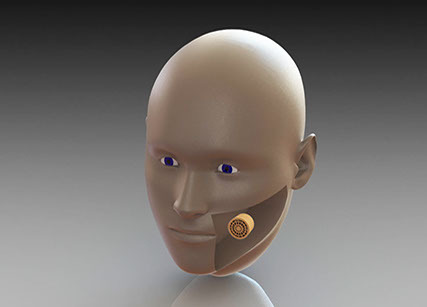 Improved VoiceMint electronic voice prosthesis . A device that resides in the mouth like a candy and restores the voice of (temporarily) voiceless patients, so that they can speak again. 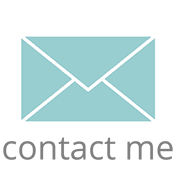 The VoiceMint can replace the voice generated by the vocal chords when people are not able to use their vocal chords or had them removed. The VoiceMint will introduce a tone in the oral cavity, which can be articulated into speech just like you would do normally with your own vocal chords. The Sound pressure level of the VoiceMint is not high enough which decreases intelligibility. It can also be that the VoiceMint prototype is missing low frequencies in the emitted sound spectrum which decreases intelligibility. Also is expected that the direction of the sound from the voice source is significant in the intelligibility of produced speech and that maybe the speaker location and direction can be important. The last hypothesis is that the used sound sample is distorted and decreases intelligibility, which would be the most easy to solve problem. To test these hypothesis I made a prototype which allowed me to quickly changes one variable of the in the test setting and I designed a test protocol as well as a measurement tool to asses the intelligibility of each iteration of the VoiceMint. 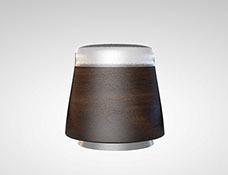 The chosen speaker and amplifier technology affect the intelligibility when distortion or low frequencies are missing; the housing needs to be designed in such a way that the speakers have a back cavity, which allows higher sound pressure levels. However a higher sound pressure level does not improve intelligibility significantly it does makes it easier to understand someone in a crowded room. The housing should also allow the speakers inside the VoiceMint to emit sound to both the cheek and the glottis of the user to maximize intelligibility. 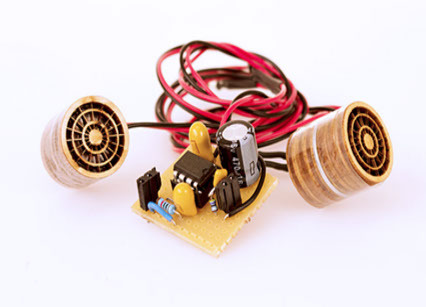 The actual wooden VoiceMint prototype used during this project. including the custom amplifier which was built for this project. Placement of the wooden VoiceMint prototype which was used during this research project. 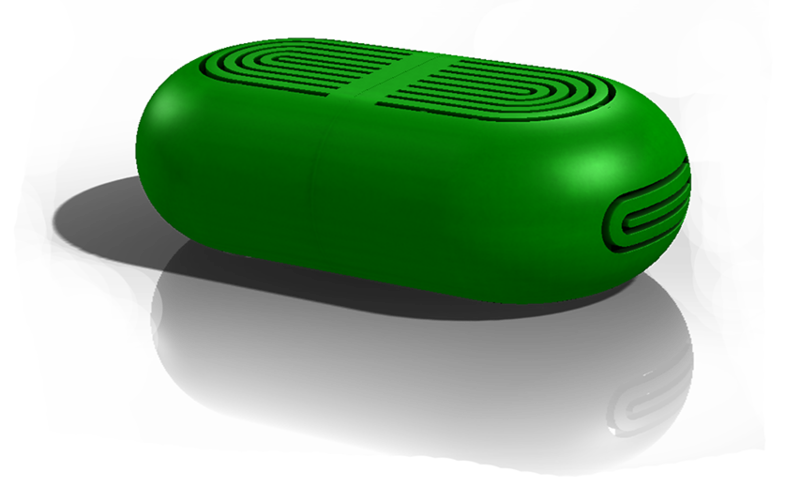 The speaker can direct sounds in 2 directions at the same time or independently one speaker at the time. During the research project the effect of direction and amount of speakers on intelligibility was investigated. The concept is to create a distraction for the child to focus on during the treatment, in this way the child can focus on something else and is not constantly reminded to the treatment of the dentist. It is proven that a task with a high perceptual load reduces distractor interference where here the distractor interference is the dentist. (Lavie, sept 2004) Two screens with bright colorful patterns are installed in the ceiling of the dentist and alternate in background colors and brightness. The brightness of each screen draws the attention from one screen to the other to keep the child focusing on different aspects the colors are used to highlight the colors in the colorful pattern of the design, which makes certain colors pop out. This iridescent color play gives the child a non-stimulating but attractive area to focus on during the treatment without being too distracted, which enables the dentist to do his job as usual. 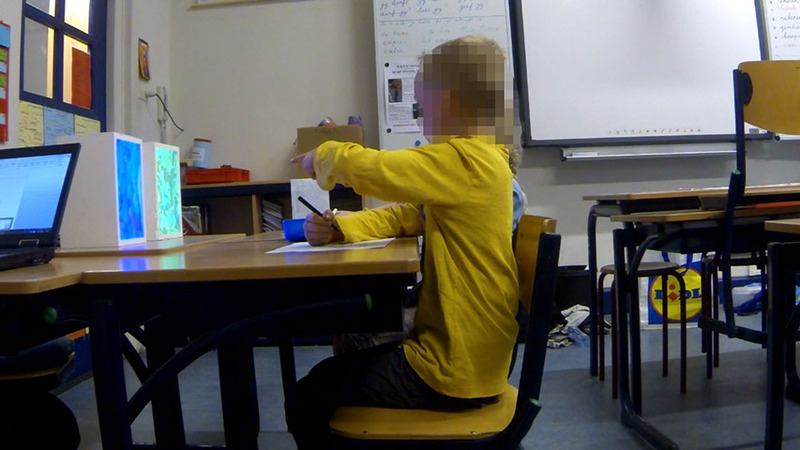 Picture of the user test with children at a primary school in Eindhoven. The faces are pixelated due to privacy. The project goal was to make LED-based lighting system more intelligent and interactive. This became possible due to driving electronics integrated with each LED module. The driver includes a micro-controller, which is also capable of reading a sensor input and adjusting the LED current depending on it. My job was to find out which interaction and thus intelligence is desired from the LED lights and to build a prototype based on this. Scope of the entire project is the system integration of LEDs with other components and technologies developed at Philips Research, which I used to enable new user experience. My goals for this semester included fast prototyping, which resulted in a strict planning. Because we focused on the intelligent lighting for the future office area, I started with the question how would offices look like and what could be expected from this kind of areas in the future (2025). I did a trend study mostly based on literature, research from other companies in this field as well as some expert meetings with facility managers and office designers. After this initial phase the Ideation phase started. The final concept was a LED module matrix on the ceiling, which measured the distance to objects with ultrasound sensors. These distance data was processed by the embedded micro-controller and based on the objects and movements in the room a desired light plan was selected. For example: a table with movement close to it was interpreted as a person working. This yields a high light output above the person and dimmed light around him. In collaboration with my internship supervisor this explanation and video were allowed to share Online. By using autonomous robots, improving the nature around us. The client in this project was Protei, a online community dedicated to clean up oil spills in the ocean. In my process, I used a pressure cooker to quickly built two prototypes. The knowledge I gathered with this experience was used during the rest of the semester in which I build my final 1.1 meter prototype. Also I was co-author of a paper submitted at ITHET 2012. Within this project, I focused on making products very cheap to produce, but mostly with of the shelf materials everybody has lying around at home. This was a new mindset for me and since my first semester here, I was interested in material selection. This semester I regained my interests in material selection and I again found out how important it is for the appearance of my products. For the future, I want to be more consciously engaged with the material selection and defining rules to select the materials on. In this project, the rules were off the shelf and cheap.